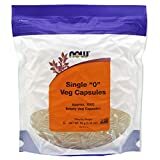 Wholistic Botanicals 0 Vegi Capsule 1000 ct. 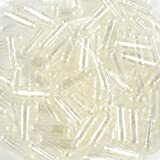 Empty Vcaps® are a new alternative to animal gelatin capsules. 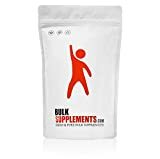 They are composed on inert vegetable cellulose and do not interfere with the digestion and absorption of the ingredients contained within.Empty capsules allow you to fill your own powders at desired potencies, and avoid tablet binders and fillers. Buying powdered vitamins and filling your own capsules can save up to 50% off most retail prices. Our Vcaps® "0", depending on the powder, can hold between 408 - 816 mg.
PRE-SEPARATED, TASTELESS & TIGHT-LOCKING, our empty gel capsules are the best fillable pills for making DIY nutritional supplements!Skip the hassles of the other brands that will leave a bad taste in your mouth- literally! SuperDosing guarantees our pill capsules will arrive intact, carry no odors or tastes & will lock tightly so your powders or oils won't leak out during storage & transport.Our bulk pack of empty gelatin capsules makes it easy and affordable to create your own vitamins from your trusted herbs and bulk powder supplements. Our capsules come pre-sorted into their two pill halves so you don't have to take them apart before filling them. Just grab one of each half out of the resealable bag, and fill away! Need different sizes of capsules? 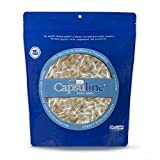 You're in luck!SuperDosing offers clear fillable capsules in:If you hate the taste of small tablet pills or your pet can smell that pill even through a pill pocket, try enclosing those pills in a gelatin capsule! They are easier to swallow than tablets or caplets, and your pet won't be able to smell medication through the gel shell!It takes about 10-30 min depending on how recently you've eaten and how much you've drankIf you aren’t completely satisfied with your order, simply reach out to us through the Amazon messaging service and we will respond within 24 hours to make it right even on the weekends. We absolutely guarantee your satisfaction or your money back! TASTELESS & ODORLESS. Our empty gelatin capsules have no taste so your custom supplement pills and DIY vitamins are easy-to-swallow with no unpleasant taste or smell.PRE-SEPARATED PIECES = LESS PREP TIME. Some brands send you empty capsules you have to take apart before you can fill them. Ours come in separate resealable bags for efficient use & storage.LOCKS TIGHT TO PREVENT LEAKS. Don't stress about whether your custom nootropic powder mix will spill out while you travel- our fillable capsules snap closed to let you know they're sealedGLUTEN-FREE & EASILY DIGESTABLE. Our super-pure, pharma-grade fillable pill capsules are free of impurities as well as gluten and dissolve gently in the stomach without irritation.101-DAY 100% MONEY BACK GUARANTEE! We stand behind our gelatin capsules and all of our products. If you’re not 100% COMPLETELY SATISFIED, just send us an email, and we promise to make it right! 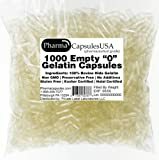 Best Botanicals 0 Gelatin Capsule 1000 ct. Separated Capsules save you 40 minutes per thousand filled. 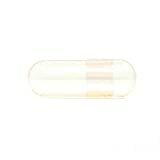 Kosher and Halal Pure clear capsules. Lowest price available..
"0" holds about 500 mg. or 1/7 tsp..
Sold direct from the manufacturer of The Capsule Machine, Capsule Connection. Note: Using separated capsules you can save 40 minutes for every 1000 capsules packed. 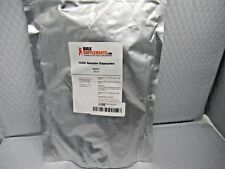 FILL YOUR OWN CAPSULES: * custom mix ingredients * use quality and fresh raw ingredients * save up to 75% * avoid use of binders or excipients Separated capsules are Kosher and Halal Sold direct from the manufacturer, Capsule Connection, LLC This sale is for the "0" size with 1000 separated vegetable capsules. 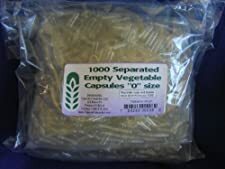 We have other listings for the "0" size with other quantities of capsules. We also have many listings for the "00" size -- with and without capsules. The separated capsules come packed in two inner bags. One bag holds the capsule bodies, and one bag holds the tops. Both bags are packed in an outer poly bag. 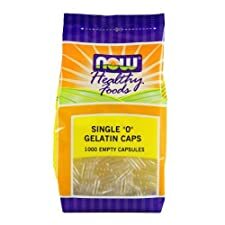 We have both 0 and 00 capsules in both gelatin and vegetable. Features Contains only vegetable cellulose extracted from Poplar or Pine trees (HPMC) and water. Safety Information Do not fill capsules with any liquid suspension because it will dissolve prior to consumption. Keep out of direct sunlight, hot water and high temperatures. Doses depend on the powder and medication that the capsule is filled with and as needed. We are manufacturer of this product. Wholesale inquiries invited Safety Information Do not fill capsules with any liquid suspension because it will dissolve prior to consumption. Keep out of direct sunlight, hot water and high temperatures. Doses depend on the powder and medication that the capsule is filled with and as needed. QUALITY - Never made in China - Highest quality gelatin capsules available, all of our capsules are manufactured in state of the art cGMP Certified Facilities (Certified Good Manufacturing Practices) meeting required healthcare compliance. Made with 100% pharmaceutical grade gelatin.. PURITY - No preservatives, Certified BSE free, made of bovine gelatin- NO PORK INGREDIENTS. ALLERGEN FREE, CORN FREE, GLUTEN FREE. Kosher, Halal. NON GMO. CONVENIENCE - All bags come in resealable plastic bags for convenience and storage, keeping product fresher longer. All capsules have a mechanical locking feature that snap closed when pressure is applied after filling..
ALL gelatin capsules are clear, easily digestible, and easily fillable with your own supplements. Create your own vitamins and supplements!. GUARANTEED SATISFACTION - Please contact us directly if you are not satisfied with your purchase so that we can make it right!. 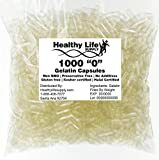 Our Size 0 Healthy Life Capsules are the highest quality gelatin capsules available, they are pharmaceutical grade, cGMP certified and laboratory tested. No preservatives, allergen and gluten free. Our capsules never come from China. Each capsule has a mechanical locking feature that easily seals the capsules for ease of use. Gelatin capsules are great for making your own supplements or filling with herbs and/or spices. Have a pet you need to feed a medication that they hate? Simply place in one of our capsules and place in their food! Pharmaceutical Grade, Highest Quality Gelatin Capsules Available. 100% Preservative Free, Non GMO, Allergen & Gltuten Free. Made of 100% Bovine Hide/Skin. Heat Sealed For Safety - Great for Manual or Machine Filling. 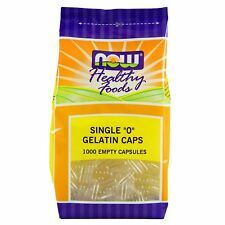 Highest Quality Pharmaceutical Grade Gelatin Capsules, 100% preservative free, NON GMO, Never Made in China. Great for manual and machine filling. Made of 100% Bovine gelatin, heat sealed for your safety. Kosher Halal, Allergen and Gluten Free. Are a new alternative to animal gelatin capsules. Empty capsules allow you to fill your own powders at desired potencies, and avoid tablet binders and fillers. Contains only gelatin and purified water. Economical and convenient way to take strong tasting vitamin or herb powders. Solaray empty gelatin caps size 0 can be filled with herbs, supplements or nutrients of your choice. Fast dissolving and easily digestible - NOTE: Not for liquids. A Size 0 capsule can be filled with up to 680 mg of powder, depending powder density. Typical fill weight is approximately 475 mg using a density of .70.. SATISFACTION GUARANTEED- We stand behind our products and our high standards of customer service..